﻿ Any Video Recorder - Record Online Streaming Videos, Rental HD Videos, Rental DVD Movies, etc. Capture Screen Activities and Record Online Video from Netflix, Hollywood Video, Hulu, Metacafe, Dailymotion, iTunes, Blockbuster, Redbox, etc. Free, Easy-to-use Video Recorder & Screen Capture! Capture streaming video from Netflix, Blockbuster, Hollywood Video, Hulu, Metacafe, Dailymotion, etc. 100% Freeware, NO toolbar, NO spy. Record online video from Netflix, Metacafe, Hulu, Blockbuster, Hollywood Video, etc. 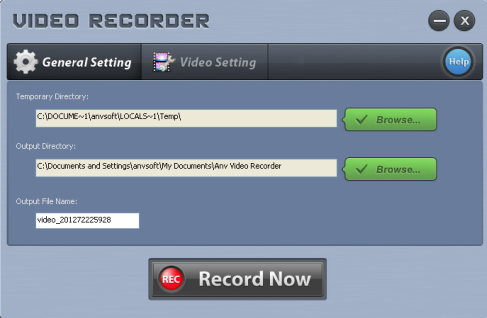 Any Video Recorder is an easy-to-use program that enables you record online videos which are restricted from downloading. With this video recording software, you can record all your favorite video clips, video blogs, music videos on Netflix, Metacafe, Blockbuster, Hollywood Video, Hulu, Dailymotion, iTunes or any other similar feed sites for enjoyment with high output audio and video quality. So that you can keep these online videos for watching them on your mobile device freely. Any Video Recorder helps you to keep the rental HD videos and rental DVD movies on your hard disc forever. With its intuitive design and powerful recording features, you can record and capture any rental HD videos and movies from iTunes, Blockbuster, Redbox, etc. If the video on your hard disc is not compatible to your mobile device, you can change the video format or frame size by playing the video using a player, such as Windows Media Player, RealPlayer, or a player embedded in a browser, and capturing the pictures from the player's window with Any Video Recorder. Besides, Any Video Recorder also supports recording all activities on your desktop for creating effective presentations, tutorials and demonstrations without any programming skills. Any Video Recorder is specially designed for recording live video streams from online video-sharing sites such as YouTube, Google, Nico or any other feed sites like iTunes. You don't need to worry about the output video image. The video record quality was guaranteed. The recorded video would came out with the excellent quality same as the source video. This video recording software provides several customization options to manage output videos for better recording experience and output video quality. This video recording software can guarantee users the best video quality with advanced video recording technology. In addition, the sound can sync with video perfectly with the advanced virtual sound card. Under General setting tab, you can customize the Temporary Directory, the Output Directory and the Output File Name for the recorded videos as you like. Under Video setting tab, you can set the target video frame rate and video bitrate. With the custom options, you can get better output video quality. Any Video Recorder's interface is fairly straightforward. The big red Record Now button brings up a dialogue that guides you through the process of configuring the recording options. It would detect video recording area automatically and you can also adjust it manually if needed. Hot key to start or stop recording is also supported. It does not involve a steep learning curve and does not demand a degree in computer science to configure and operate. Any Video Recorder is designed to record screen activities and capture online videos without any limitations and hidden costs. This is freeware of new level, which offers a quality alternative to paid recording software. You can get this Free video capture for life-long without paying anything. Currently, Any Video Recorder has different language versions such as English, Japanese, German, French. We are paying efforts on perfecting this video recording software with more languages for more users. NO toolbar, NO spy, NO ads, NO virus, NO user tracking. Get it freely right now.